I can't get enough of xiao long bao (Shanghai soup dumplings), and I've always thought that Din Tai Fung had the best ones in Sydney, so when I found out there was a new kid on the block that was dishing up decent dumplings, I had to pay it a visit. Lynn Shanghai Cuisine is obscurely located in the Castlereagh Club. You'd never stumble across it by merely walking down Castlereagh Street. The fit out is spacious with a black and red colour scheme. I'm making a visit with my fellow dessert and dumpling-loving companion Miss S. She mentions how this restaurant is much more comfortable because you're not squeezed in like at Din Tai Fung or Chefs Gallery. But it does have that window, where you can see the experts hard at work hand-crafting noodles and dumplings. The first thing we try is the Cucumber Roll with Garlic in Special Sauce ($6.80). Admittedly, it looks very pretty and I definitely enjoy the pickled taste combined with the fresh chilli. Of course we order the Xiao Long Bao ($8.80) - on the menu they're called the Famous Shanghai Steamed Pork Buns, but really they're dumplings not buns. They're definitely very tasty, and I'd say they're right up there near the top of Sydney's best. The Shallot Pancakes ($6.80) are quite small, but very thick and dense. They're quite nice, but I think I would have preferred it if they were fluffier and crunchier. The Vegetable and Pork Wonton Noodles in a Hot and Spicy sauce ($10.80) are actually not-so-spicy I find. But then again I'm a chilli fanatic, so it's very rare that I'm faced with a dish that's too spicy. My friend, Miss S, doesn't like the noodles that much, but I do. The dumplings are tasty and make a great addition to the noodles. The Fried Rice with Chinese Broccoli and Prawns ($13.80) is unfortunately a let-down. I love a good Chinese fried rice, but this one is lacking in flavour and zing. Miss S and I decide to share a Combo Milk Tea ($5.80), but I end up pushing it away from me because I'm not a fan. 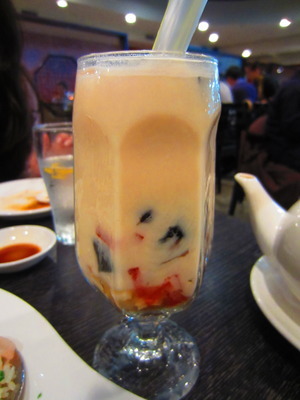 I like the rainbow jelly, pearls and grass jelly, but the actual drink isn't up to my standard. It doesn't taste like tea to me - just sugary milk. You'd be better off making a stop at Chatime, if you ask me. Miss S and I are dessert lovers, but we decide against getting dessert tonight (to our utter dismay). We'll definitely be returning through to give the other dishes a shot. The sweetened glutinous Black Sesame Mini Rice Balls in Rice Wine were calling out to us like sirens. There's always next time. Especially with the 20% discount until the end of October 2011 if you book online. There's great service here, and it's almost too attentive at the start (we do arrive at 6pm, so maybe that has something to do with it). But unfortunately when we've paid the bill, we don't get our change for at least 20 minutes and only after we've asked for it twice. If you're a fan of Shanghai cuisine (and xiao long bao! ), I definitely recommend this new addition to the Sydney food scene. I will certainly be returning again soon. Is it really close to real MacCoy ? Would like to check the Xiao Long Bao. This place looks delicious. I am all of a sudden getting very, very hungry.